AeroSvit kind of sounds like a name for the saliva Steven Tyler graces the front row of his concerts with. Janusz (pronounce Yanush) says, "Svit" in English means "dawn or daybreak" it is straight transcription from Cyrillic script. Reasonably nice bag, but their English spelling could use help. 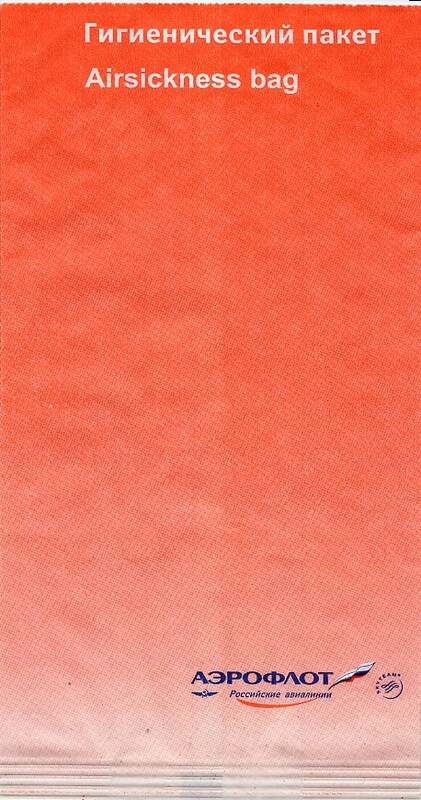 Instruction #1 asks you to fold on the "doted" line, and instruction #3 tells you to "Prees". An excellent, large bag from a Saxon flying club in Germany. The bag shows two planes dive bombing the same target. The bag construction is unlike any other -- the sack bottom is patterned after a hexagonal crystal. All around nice bag. 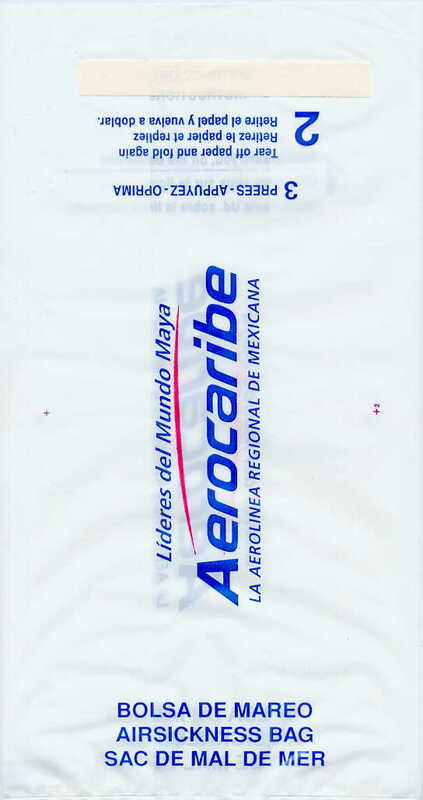 This Bolivian airline is the Linea Aerea Bandera del Beni. You read that right, Beni, not Benin -- a place that I'd enjoy having a bag from. 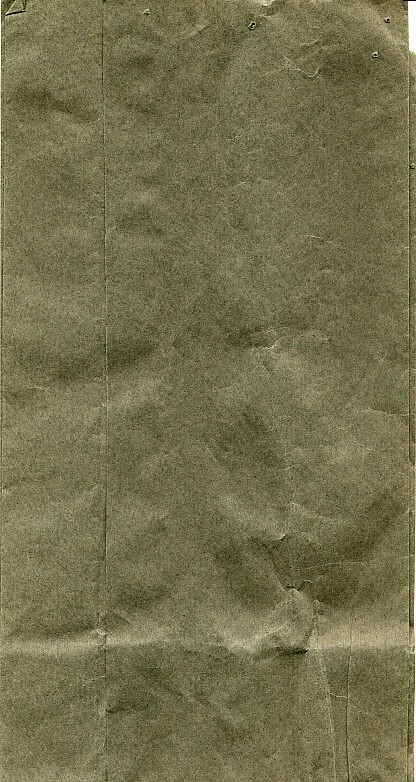 A very minimalist Aeroflot, plain khaki green, the signature of Aeroflotness. The big red Cyrillic letters on this bag scream Soviet Bloc. 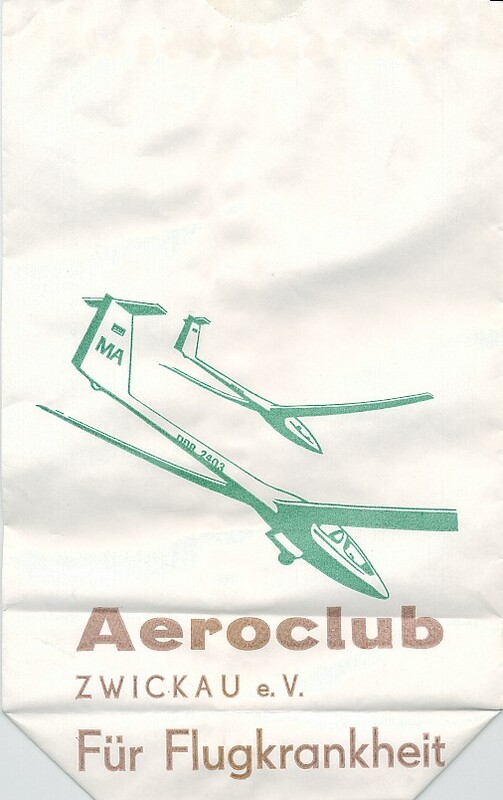 Very similar to the old Aeroflot with the flying M logo. 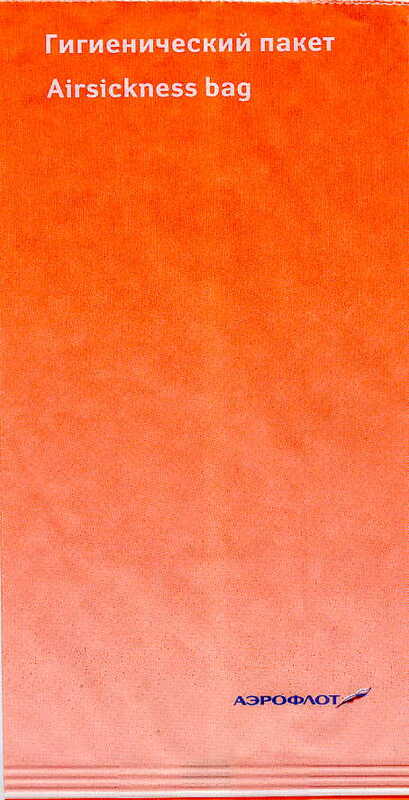 Most of the text is the same, but it has a blockier font and is parsimonious with text. 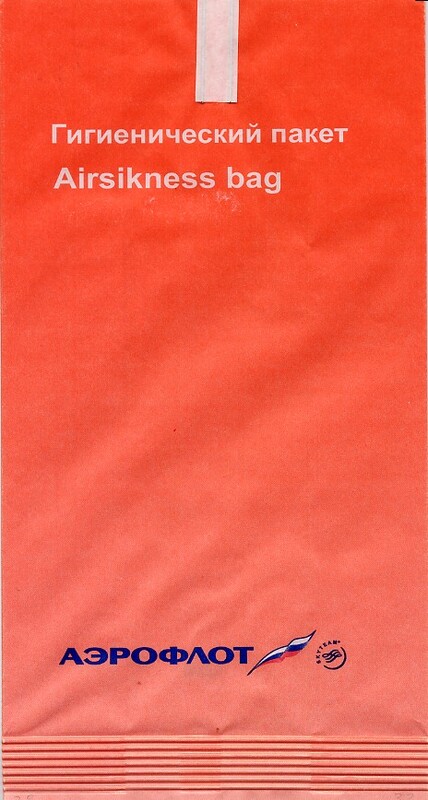 I had no idea what airline this was from, but savvy bag connoisseur, Jennifer Ann Fox says the bag is an old Aeroflot. 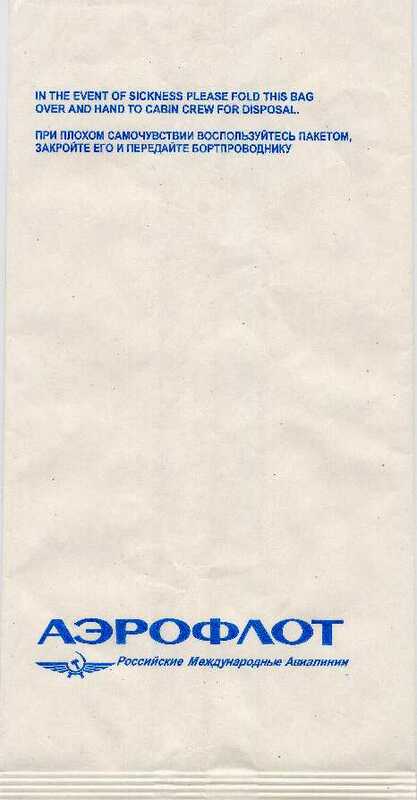 It says, "HYGIENIC BAG"
Bag made from specially treated paper and not fit for edible products. Well thank goodness they tell you. I was thinking of putting a milkshake in there. PS: I love the big M logo. 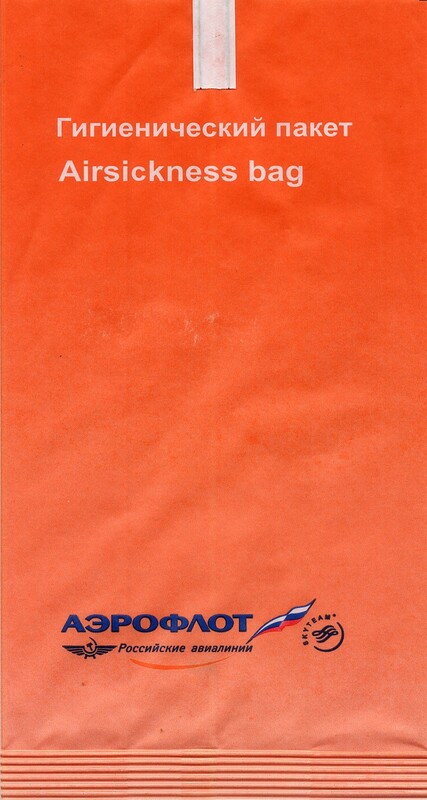 Identical to other Flying M logo bag, except the Cyrillic text next to the serial number is BTY, not simply TY. Ebay item. The bag sports a HUGE logo.. According to Barf Braniac Charles Sugg, this bag is from 1975. He says, "I have one with that design. 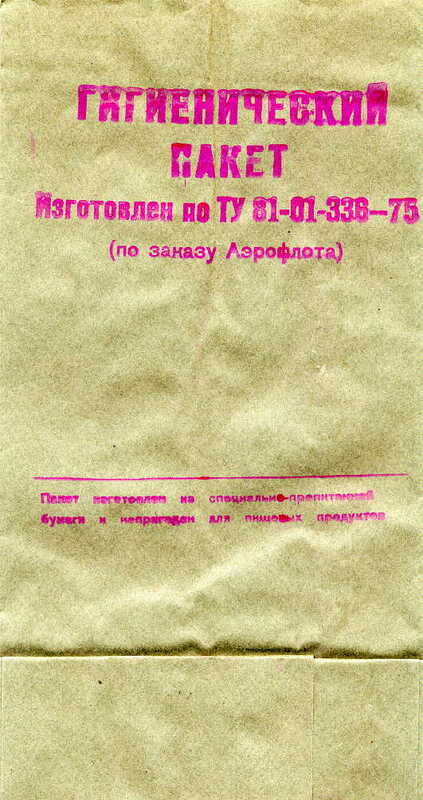 Liberated in Jan. 1975 from a chartered Aeroflot Ilushin-62, tail number CCCP 86682." 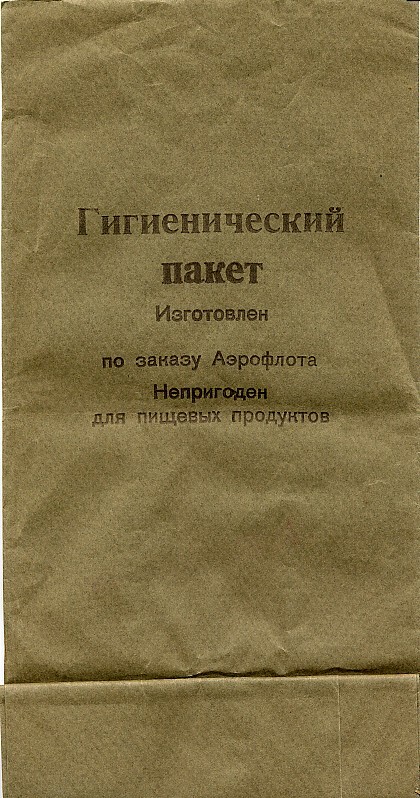 I was told at the time that it translates to "Sanitary Packet". In-flight perks leaving the USSR included hard boiled egg slathered with caviar and about a triple shot of straight Russian vodka. And that was in steerage! Looks like capitalism hasn't manifested itself in advances in the design realm. 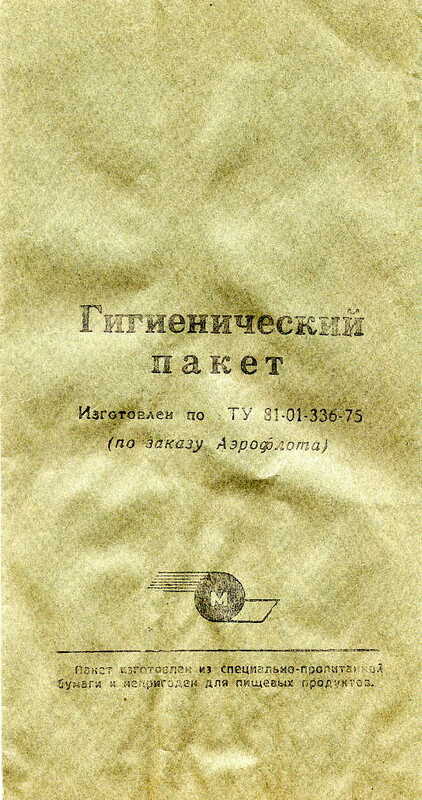 Somebody, probably a former Soviet official, decided that the quotes around the Russian instructions just had to go. The font was slightly changed as well. 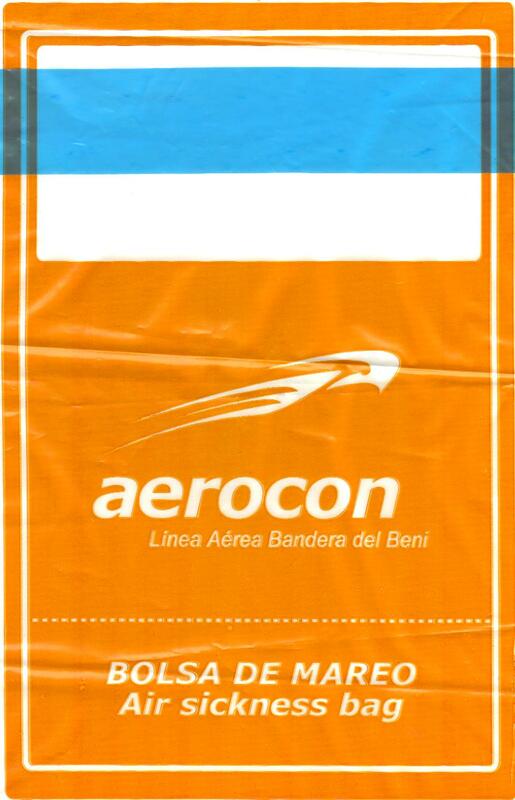 Aeroflot tweaks their bag by centering the text atop the bag and removing one of the Russian words under 'Aeroflot'. I wonder what was so offensive about that darn word they removed? 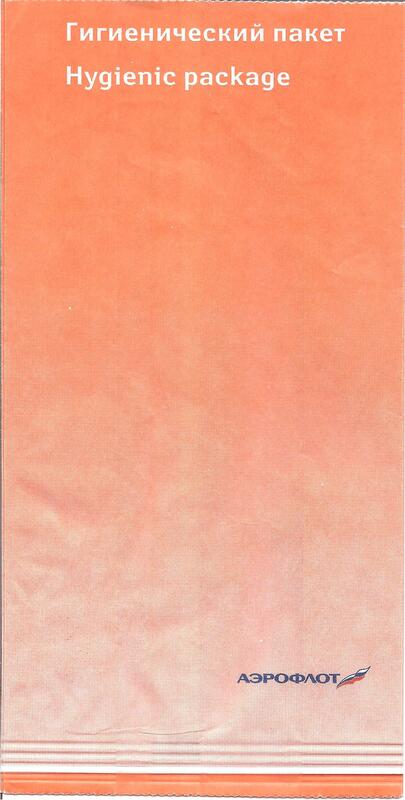 Aeroflot radically alters its bag with a soothing orange tint, much like St. John's Children's aspirin. Nice pen quill near the logo, even if it was printed out of register. Aeroflot celebrates becoming a member of the Skyteam with a new bag. 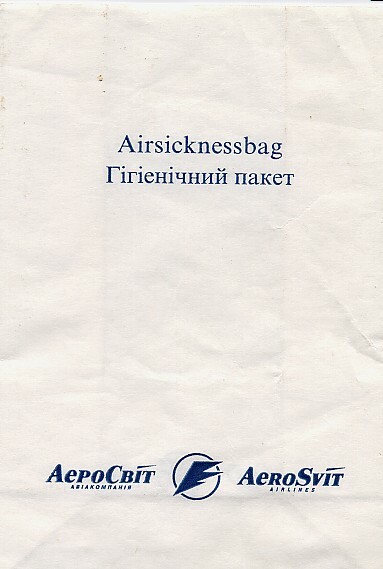 Aeroflot celebrates becoming a member of the Skyteam with a new bag, but on this bag, they misspelled the word Airsickness as Airsikness. Of course, if I had to spell things in Cyrillic, I'm pretty sure I'd botch a few words too. 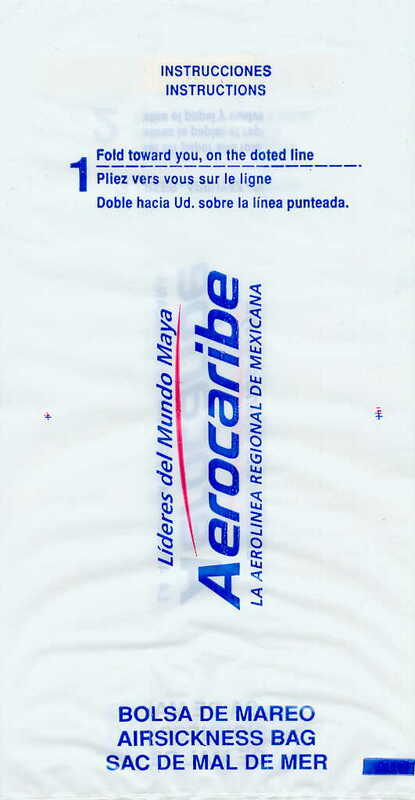 Almost identical to the correctly spelled 2008 version, but the logo is larger and has been centered. 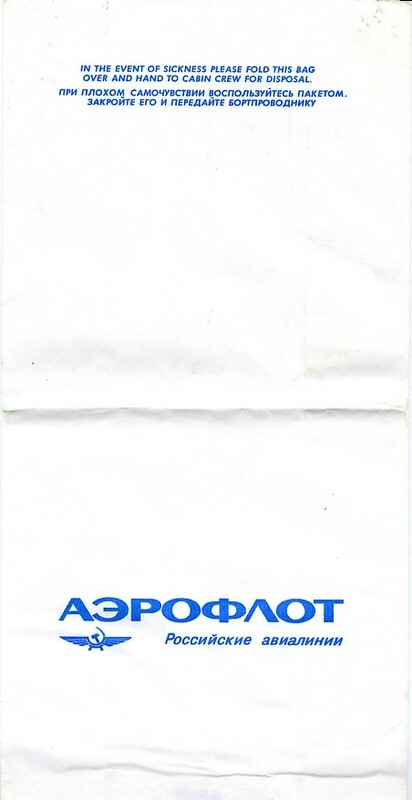 Aeroflot decides to change the description from Airsickness Bag to Hygienic package. The Russian words have not changed however.